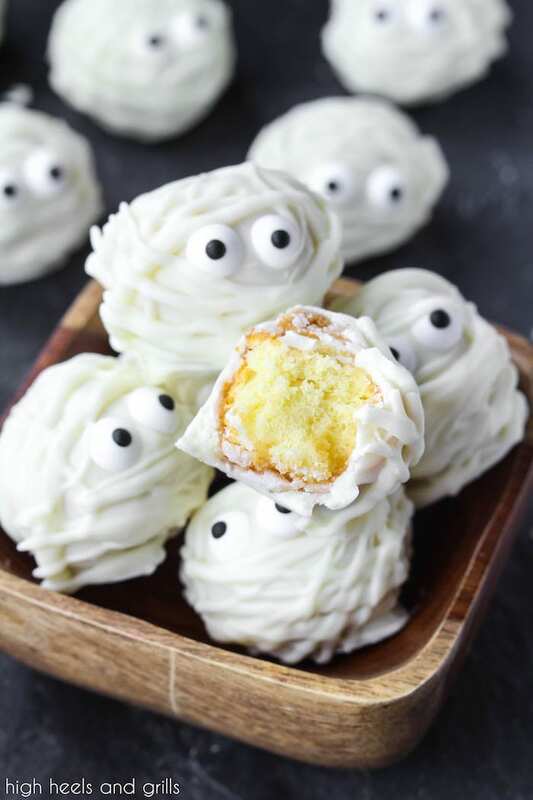 These Easy Halloween Treat Donut Hole Mummies are one of my favorite Halloween treat ideas! They don’t take a lot of prep and are meant to look messy. Basically, they are pretty hard to mess up! I am a total sucker for holiday-themed food. It’s so stinking cute, but it’s also usually super easy to make! Like my Chocolate Covered Pretzel Pumpkins, or Mini Alfredo Pizza Ghosts, or Candy Corn Layered Punch. These all make me feel like the fun mom, but not at the expense of my sanity. 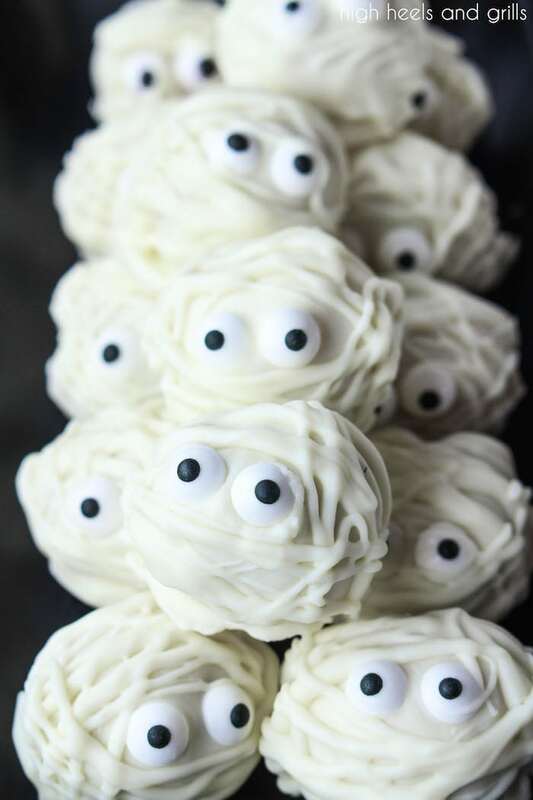 These Easy Halloween Treat Donut Hole Mummies fit right into all of these. 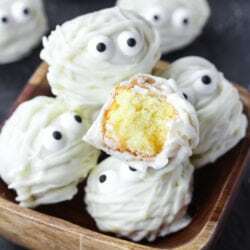 They look like you put a lot of work into them, when really, they require just three ingredients, no baking, and turn out adorable every single time. White dipping chocolate. I have used a number of dipping chocolates and I always find myself to keep coming back to Candiquik. It has a perfectly smooth consistency every time, doesn’t harden too quickly, and is really easy to melt. Kroger has a store brand version of this for a little bit cheaper, if needed. Donut holes. Obviously. You can try making your own to dip, but I find it super convenient just to buy some, especially if you’re trying to keep things simple. Candy eyes. You can find these in the cake decorating section of almost any grocery store. -Pick a donut hole that has a glazed outer shell. If you pick one with crumbs or powdered sugar on the outside, it is going to gunk up your dipping chocolate. -If you don’t want to pay the money for the candy eyes, you can use chocolate chips or black icing for the eyes. -These are meant to look messy, so don’t be afraid to overdo it. Just avoid getting the chocolate directly on the eyes and they will look great! Melt the Candiquik according to package directions. Place the donut hole on top of a fork and lower it into the melted chocolate, making sure it gets evenly coated. When you take it out of the chocolate, wiggle your fork a little bit to get any excess chocolate off. Transfer to the wax paper. Before the chocolate hardens, place two candy eyes on the donut hole. Then lets harden completely. Let harden completely and then enjoy! 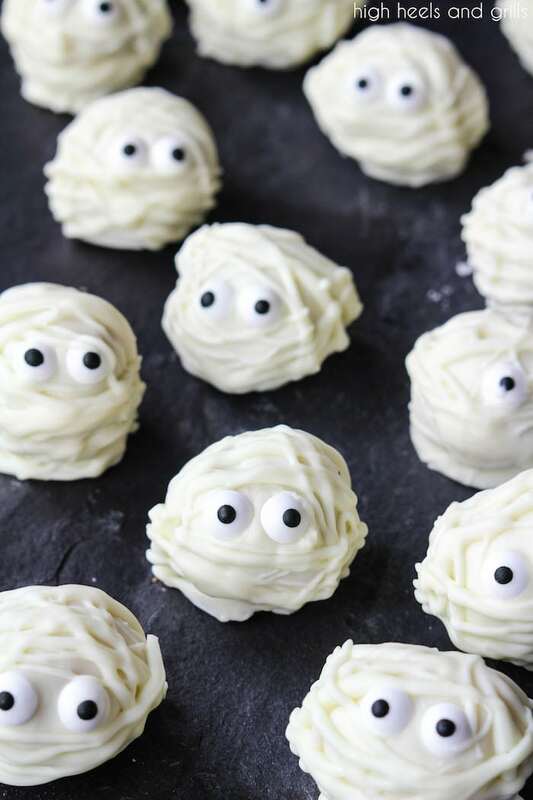 These Halloween treats look absolutely adorable and so delicious!